Supervisor Terry Gonser is proposing going back to the form of Township governance our community had prior to 1998, where his position would be a full time position. There are several 2016 Oakland Township Board candidates that support Terry Gonser’s re-election candidacy, and presumably support his desire to make this change. 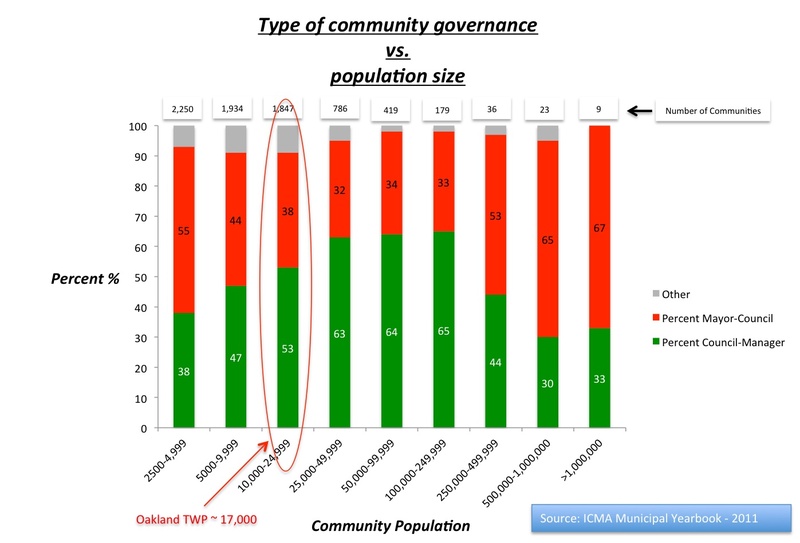 Statistics published by the International City/Council Management Association (ICMA) indicate that many communities are moving toward the form of governance Oakland Township currently has, not away from it. Their data indicates the size of a community influences the form of governance the communities choose. After several attempts, we have not been successful in obtaining written statements from Supervisor Gonser (although his past actions make his position clear) , or several other Board candidates, regarding their position on this issue. The citizens of Oakland Township deserve to understand each candidate’s position before they cast their ballots. Unfortunately the following have been reluctant to provide their positions. As you can see, when a community is small in size, it tends to have a “Mayor-Council’ or “Supervisor-Board” form of governance. As it grows, and the complexity of managing the community increases, it tends to move toward a “Council-Manager” or “Board-Manager” form of governance, where a professionally trained manager handles the administrative issues of the community at the direction of the Board. Once a community gets above 250,000 residents, the “Mayor-Council” form of governance comes back into favor. Oakland Township’s 2010 population was almost 17,000. With that population size, 53% of the 1,847 communities surveyed have a “Board-Manager” form of governance, similar to what Oakland Township currently possesses. The reasons for the increase in popularity of this form of governance are expressed by many of the the Oakland Township Board candidates that support retaining our current form of governance, SEE 2016 CANDIDATE OPINIONS, as well as the Kalamazoo Township Board that is moving to this form of governance, SEE KALAMAZOO BOARD DECISION. Why is this important to the citizens of Oakland Township? As previously stated, there are several 2016 candidates that support Supervisor Gonser. If they get elected, they may be successful in making his position a full time position. There are a few candidates (identified above) that have not provided their position on this critical issue. Please consider the information that is available when you vote. This entry was posted in 2016 Candidate opinions, Board of Trustees and tagged Abuse of Power, Gonser, oakland township, Oakland Township Board, Strong supervisor form of governance, Supervisor Gonser, Supervisor Terry Gonser, Terry Gonser on June 23, 2016 by richardjmichalski. 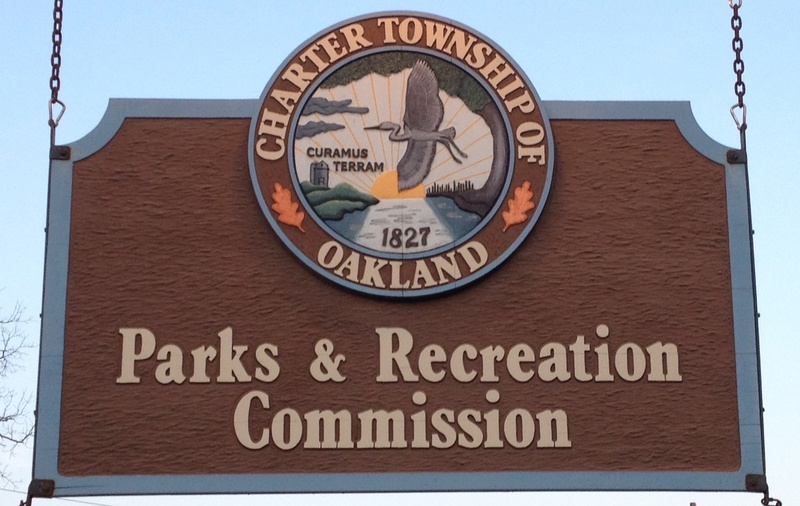 The editors of this website have reached out to all of the candidates that are running for Oakland Township Board positions this summer. We have asked for their opinion on an important issue facing our Township. The issue pertains to the form of governance Oakland Township will possess in the future. Will it be the “Board/Manager” form of governance that we currently have, or will it be the full time “Strong Supervisor” form that current Supervisor Gonser has been proposing since being elected in 2012? Please consider the positions of the candidates on this issue when you vote on August 2, 2016. Also, please share this information with friends and relatives in our community. So far, this is the only forum where candidate opinions on issues have been shared. NOTE: If you have another issue that you would like to obtain each candidate’s opinion on, please make that request by adding a comment at the bottom of this page. We will try to get responses from the candidates on the issue you raised. This entry was posted in 2016 Candidate opinions, Uncategorized and tagged 2016 Oakland Township candidate opinions, Board of Trustees, oakland township, Oakland Township Board on June 7, 2016 by richardjmichalski. What are the official Facebook pages for Oakland Township and the “Oakland Township Park Protector” candidates? There may be some confusion in our Township regarding the authenticity of ‘official’ Facebook pages that are on the web. The Oakland Township Watchers editors have received an email from Oakland Township administration requesting that we clarify which sites are the only official sites of the Township. 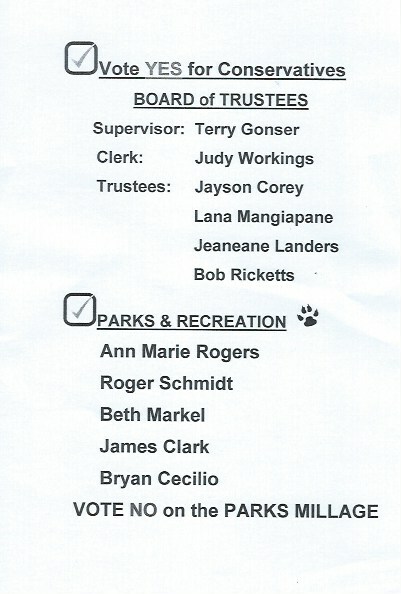 Similarly, the group of seven candidates for the Parks and Recreation Commission, who are endorsed by the longstanding members of the current Parks and Recreation Commission, and call their group “Park Protectors”, have a website and a Facebook page. Their rival candidates have a surprisingly similar Facebook name. Here are the links for the “Real” Oakland Township Park Protectors. Please visit their website and Facebook page to learn more about these seven candidates, then make every effort to remember their names for the August 2nd election. This entry was posted in Uncategorized on June 1, 2016 by richardjmichalski.